The U.S. Census released a report on urban population on Monday, and in it was a perhaps-unexpected fact: Of the ten most densely populated cities, seven of them are in California. Indeed, California’s showing was so strong that the great bastion of urbanism in the United States — the New York-Newark metro area — just barely made the top five. Tim De Chant: What’s special about California that it has so many dense urban areas? Jon Christensen: The American West, in general, and California, in particular, is really a metropolitan region and has been for a long time. 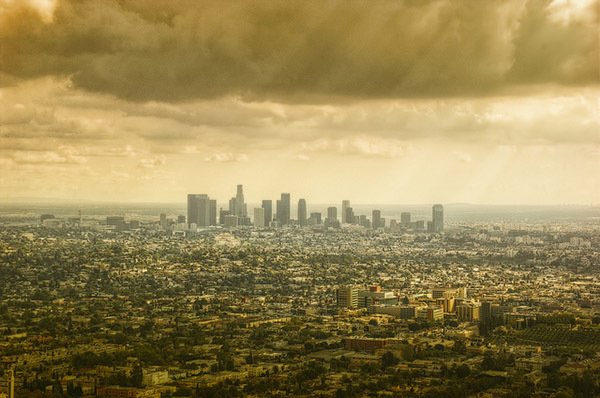 California, Nevada, Utah, and Arizona are among the 10 most urbanized states. The settlement pattern in the West is one of concentrated cities surrounded by wide open spaces — often substantially made up of public lands. This is true of California as well. So it’s really the interplay of the history of cities and their hinterlands in the American West that explains why California has such dense urban areas. The fact that they are among the most dense urban areas in the country is also a result of population growth in California. The state has been and still is a great place for many people to live. De Chant: In your chat with John King, you said, “It’s a legacy of how in our minds’ eye we have always separated California into ‘urban’ land and ‘productive’ land and then wilderness, the cathedrals of nature.” Do you think that mental dichotomy has played a role in how California urbanized? Christensen: I actually think that the way we have urbanized and the creation of that mental division, which is really a legacy of John Muir’s vision of California, have both played crucial roles in how we think about cities in California. This, in turn, shapes the way that density is measured, of course. Take the San Francisco-Oakland urban area, which as it is measured by the Census includes the populated areas of Marin but not the open lands of the Golden Gate National Recreation Area just to the west. If those lands were included in the San Francisco-Oakland area, the denominator for the equation of people per square mile would be bigger, and the measure of density would be lower. That wouldn’t change the fact that the city is still one of the most densely populated in the country. But it does miss the fact that we live in a very densely populated metropolitan region that also has ready access to conserved public lands practically at our doorsteps, or a short drive or bus or bike ride away. De Chant: In other parts of the country, that distinction isn’t so clear. Has that played a role in sprawl? Christensen: I’m not sure that the mental distinction has played as important a role as the existence of public lands. Of course, public lands are, in some ways and particularly in some cases, the products of intentional human agency, political organizing, and conservation movements. This is true of the Golden Gate National Recreation Area and much of the rest of the lands protected around the Bay Area, for example. A strong conservation vision runs deeply through the history of the Bay Area as Richard Walker shows in his great book The Country in the City. That explains a lot, here. But it doesn’t necessarily explain Los Angeles, Phoenix, or Las Vegas. For that, we have to look at public lands that were never homesteaded and thus have, to varying degrees, constrained cities. We also have to look at geography and topography. The San Gabriel Mountains constrain Los Angeles even more than the coastal mountains constrain the Bay Area. De Chant: In a tweet you said you think of California as “quite a mixed up rather than clearly divided landscape.” Why the divide between the California of our imaginations and the California of reality? Christensen: I think we still live in John Muir’s California in our minds, a state divided between the cities, the productive landscapes of farming, ranching, and mining, and the wilderness cathedrals of the Sierra Nevada. I think that’s changing as we recognize that people have played a role in constructing, shaping, and changing nature from the city out through the countryside and even to the wilderness, and that nature runs through it all as well. The focus on hybrid human and natural landscapes, novel ecosystems, and ecosystem services all point to the ways that our thinking about nature is changing. But it’s changing slowly. John Muir’s California is still a powerful vision. It’s just too simple to be very useful in thinking about the present, let alone the future. De Chant: In much of California, nature never feels far away. Why is that? Christensen: Because it never is far away. Because of geography, topography, the history of settlement, and a long history of conservation efforts, wild nature is close in to the city in much of California, sometimes right in the middle of the city. We’re also bringing nature back to the city, daylighting creeks, restoring the L.A. River, planting urban gardens. And we’re increasingly realizing that nature is in the city already. It never went away. And we need to be more cognizant of the processes of nature that flow through the city and of which the city is made if we are going to fashion more sustainable urban living here in California and around the world. De Chant: There’s on old saying, “As goes California, so goes the nation.” Do you think that’s the case with urban development? Christensen: I do think that we have many useful things to share with the nation and the world from our history and experience. And from our current efforts to understand and shape nature in our metropolitan regions—in San Francisco, but even more so in Los Angeles, which is truly a global city in so many ways and the most densely populated city in the United States, as it happens. But I don’t think it’s a simple matter of “as goes California, so goes the nation” or the world. Differences are important, whether they are historical, geographic, political, economic, cultural, or other differences. I think there are many similarities between cities in the United States and around the world, which makes me think that vocabularies, rules of thumb, lessons even, could be transferable. But they will have to be adapted to different cities, by the people making those cities. De Chant: How do we transfer those lessons learned in California to other places? Christensen: Your saying that “as goes California, so goes the nation” does get at a historical reality that California has been a site of innovations in ideas, technologies, policies that have influenced the nation and the world. And our dense cities in the San Francisco Bay Area and Los Angeles have also been key nodes in global networks of ideas, commerce, technology, and even species. The eucalyptus and palm are iconic examples. So I think the lessons will spread. But I also think it’s imperative that we speed up the process. Over roughly the next two generations the urban population on the planet will double, and the urban built environment will have to double. How that happens will dramatically shape the future of how human beings live together and live with nature on Earth. I don’t have answers, and I’m eager to learn, but I think we can start by mining our rich, diverse history and experience of thinking about and doing conservation and development together, in relationship to each other, over time in our cities, to come up with some common vocabularies, ways of speaking about this relationship, and rules of thumb, basic guides to planning and constructing hybrid human and natural cities, that can be adapted to different circumstances in different places. Then we need to figure out how to share these conceptual tools with the people who are actually going to build the cities of the future soon.